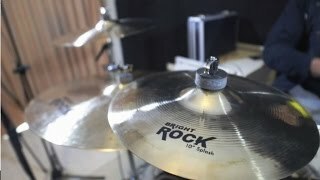 Artist cymbals are made using a combination quality craftsmenship plus tried and tested lathing and hammering techniques to produce the best sounding cymbals at the fairest prices you'll find. You have to hear these to believe quality. The Bright Rock series is perfect for Rock, Metal, or any style where your cymbals need to be heard. The combination of a heavy thickness and brilliant finish means your cymbals will cut through without sounding harsh and with minimal overtone. Great for players of all standards.